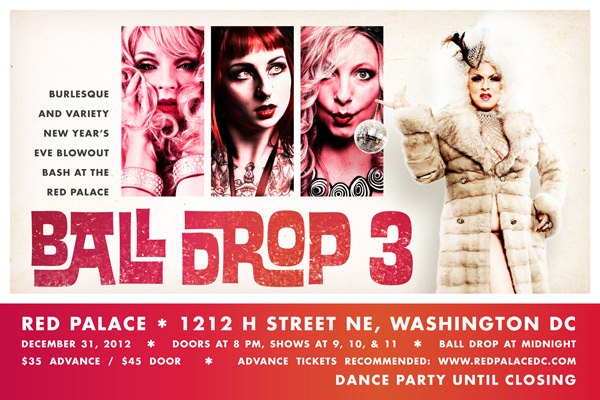 Doors at 8 pm, Shows at 9, 10, & 11; Ball Drop at midnight; Dance Party until closing! Step right up, ladies & gentlemen, for a New Year’s Eve spectacular at the RED PALACE, the only vaudeville stage, oddity museum, and full bar in the world! This year’s BALL DROP features bodacious burlesque babes, death-defying novelty acts, twisted sideshow oddities, quirky musical surprises, go-go dancing, and an all-night dance party. After sold out shows in 2010 and 2011, BALL DROP returns to the Red Palace for a bigger, brighter show, starring international talent, local favorites, and you! Starring the award winning, international art star, Julie Atlas Muz (NYC); “burlesque expert” (NY1 & Big Think), Dr. Lucky (NYC); circus artistry from Miss Joule and Malibu of Tilted Torch (DC); gravity-defying aerial and jaw dropping burlesque from Deanna Danger (Richmond); mesmerizing bellydance and twisted vignettes from Khalima (Richmond); super sassy burlesque from Gigi Holliday and Cherie Sweetbottom (DC); and quirky ukulele from award-winning pop sensation Pop (NYC) of Gigi & Pop. DJ Momotar, New York City’s “Best Dressed DJ,” spins the party tunes all night long. Thank you to BritishInk Tattos, Boom Boom Basics Burlesque School, The Rock & Roll Hotel, Speak Vintage, Tilted Torh, and the cast of Ball Drop for donating goods and services for our amazing Raffle Prizes! 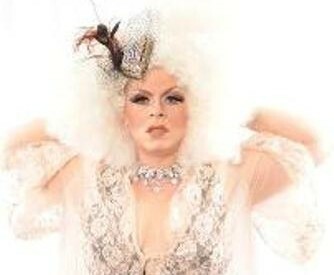 If you would like to donate, and get your product seen by hundreds of potential customers at the most eclectic New Year’s Eve party in Washington DC, please email doctorofburlesque@yahoo.com. ← Surrealist Burlesque Returns to Coney Island August 23rd!